Long time, no post! I have been CRAZY busy! We sold our house, are in the process of moving out of state, and I will be teaching first grade in the fall! Whoot!!!!! 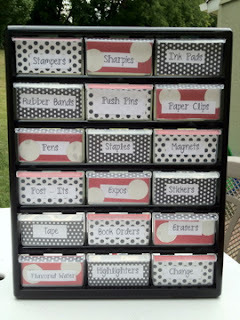 I just had to jump on the bandwagon and make a teacher toolbox. I don't know about all of you, but I am going to go B.R.O.K.E if I keep logging on to Pinterest! Anywho... I saw a BUNCH of posts about these teacher boxes and I wanted to share! You can see them here, here, here or of course here! I don't know if anyone else had a heck of a time making theirs, but I sure did! I couldn't find anything to stick to the plastic of this tricky little plastic! I tried Zots - maybe they weren't big enough, I don't know. I tried double sided sticky tape (I think because I was using glittered scrapbook paper it wouldn't stick??? ), so I finally used just good old packing tape! The paper that didn't have glitter stuck great with either zots or super glue! We will see how long it stays! so here is my toolbox! I am always putting random stuff in mine, like lunch money change, book order checks, crystal light packets, and ink pads. That is why you will see some random stuff! Please be a new follower, and leave me a comment!!! This is so awesome. I'm glad you came over and posted this on Thursday! I pinned it on my pinboard! I'm going to try to make something like this...wish me luck! Really Helpful Information About Teacher Toolbox! How to be a Primary Teacher and what is it like to be a primary school teacher in the 21st century?